Since ther is currently no place (other then this, when it is robotics relates) to ask industrial automation related questions (PLC programming, Motors and drives, HMIs Control systems etc.) I started an SE proposal. Feel free to support the proposal if you see the need for it. 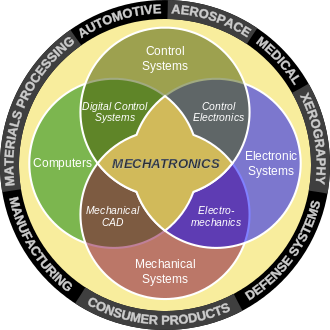 I'll chime in that I generally view "robotics" as a holistic term, referring to systems as opposed to components. For example, if you want to "learn robotics," you should study mechanical, electrical, electronic, and software engineering. In that spirit, questions that I consider most appropriate are the questions that span two or more of those categories and also the questions that fall in one category but whose answers apply to a second. Examples would be help doing a drive cycle analysis (mechanical) to spec a motor (electrical), or troubleshooting an implementation of an algorithm (software) to achieve a desired control scheme (mechanical/electrical). The first example requires knowledge of performing a drive cycle analysis and how those results impact motor selection (peak power, average load, duty cycle, etc.) You would otherwise you would have to ask how to perform the drive cycle analysis to get that curve, then ask on another site how to use that curve to pick a motor. The second example requires the person answering to have some understanding of the control scheme to find the flaw in the implementation. The lesser appropriate questions, again in my opinion, are the ones that stick strictly to one category. Examples would be my Arduino code won't compile (strictly software), my motor doesn't turn when I apply voltage (strictly electrical), how do I specify the size of a structural arm for a robot (strictly mechanical). Here the problems are syntax, voltage/wiring problems, and structural analysis. They can all be answered on one site without needing to ask related questions based on the answer of the original question. Those questions are fully self-contained in one category. They are not, in my opinion, robotics questions. Those lesser appropriate questions, while debatable as on-topic or not, could get better answers, and get those better answers faster, if they were asked on the appropriate site (Arduino.SE, Electronic.SE, or Engineering.SE, respectively). There was a meta post a while ago asking if we (probably directed at me) should be so quick to close questions that are debatable as off-topic. I took this to heart and decided to allow the questions to remain longer, and now make a genuine effort to wait until there are at least a couple close votes from the community before I close a question. That said, I still always try to act to the benefit of the OP. I migrate a question not to get rid of it here, but because I think OP maybe didn't realize that they could get better answers, and faster, at a different site. So, 50k4 mentioned PLC programming questions in Stack Overflow as an example of questions that "don't receive much attention there." A glance at the most recent 100 questions tagged "PLC" at SO (page 1 page 2) shows that 35 of those 100 have an accepted answer. In comparison, there is one question at Robotics.SE that is tagged with PLC, and it does not have an accepted answer. I manually calculated the average number of views per question on SO on the 100 most recent; it's 135 views per question on average. The one question on Robotics that is tagged PLC has 138 views. Now, here's the real difference - the question on Robotics, having no question, has been bumped occasionally by Community since it was asked, in December of 2014. The oldest question of the 100 most recent on SO was asked in November of 2015. The Robotics question is almost a full year older than any of the ones from SO, but still has approximately the same number of views. My point is that it might feel like the questions on SO are getting low views, and it might actually be getting low views for that site, but the traffic to Robotics is a rounding error for the traffic to SO. Robotics got 47k visitors last month; SO got 48M. Now, none of this is against the idea of having industrial automation questions here. That's a terrific idea and I'm 100% in support of it. What I would be reluctant to do is to say that we should create a site that supports a bunch of questions that are more appropriate for other sites. Using Robotics as an example, there are some questions that transcend any one particular category. These are the questions that Robotics was made for. There's not a huge demand for really good questions, and as @MarkBooth mentioned we'll probably never leave Beta, but that's okay. There will still be questions that are related to electronics and mechanics that are beyond the scope of either of those sites individually. My challenge to you would be to come up with a set of questions that transcends what is currently available. When you write a question, ask yourself what body of knowledge is required to answer the question. If the question only requires the person answering to be knowledgeable in one field (PLC programming OR HMI programming OR network interfacing OR finance, etc.) then I would argue it's not worth creating an entirely new site for. Ask those questions at the corresponding sites and get good answers fast. Is a DNC system worth it if the machine controllers run Windows XP or higher? This requires a knowledge of DNC systems and how they are implemented AND a knowledge of business finance to determine how the costs are amortized. When is it safe to use an Arduino on equipment over an Industrial PLC? This requires knowledge of Arduino capabilities AND industrial security/software standards and best practices. Is it bad practice or unsafe to run a file watcher, console program on a machine controller to grab info from G-Code output? This requires knowledge of file watchers AND the G-code to machine process. Is there a better way to send measurement data to a CNC than automatically writing a G-Code program to set the global variables? This requires knowledge of G-code programming AND CNC data protocols. How could I reuse the PLC code (structured text) I wrote for a Siemens PLC in a Rockwell project? Requires knowledge of Siemens and Rockwell programming, but it's all within the field of programming knowledge. How to properly dimension a PMSM motor and a drive amplifier for a specific task? What input is required and what is the workflow for dimensioning? Requires knowledge of industrial drive specification, but it's all within that field. How to calculate Return on Investment on a system that completely takes over a given process? Requires finance knowledge, but it's all within that field. How do I calculate a modbus checksum to append to a manually created modbus message in a Magelis panel that is sent to the com port? Requires modbus knowledge (or really even just checksum knowledge). The source and destination are irrelevant. For a GE Machine Edition PLC project are there any tools that can identify coils or registers that are read from but not written to? Shopping question - tools that exist now may not exist in the future, and vice-versa. Are there any cross platform HMI's that could run the same project on (for example) Windows or Linux? Shopping question. Are there any open source SCADA systems, or at least HMIs? What communication protocols do they support? Shopping question. Each of these questions ask "Are there any?" I could say yes or no and be done with the question. I could give list A,B,C and someone else could give list X,Y,Z and both lists could be completely accurate. Who has the right answer? Am I looking for content that can't be found anywhere else on StackExchange? Those are the questions that should be examples, and the reason you're starting the site. We ask and answer questions about robotics and automation systems, control systems, control theory, algorithms, actuators and sensors. While I wish you the best of luck with your proposal, many of the example questions would already be on topic on either here, on Stack overflow, on Electronics or on other Stack Exchange sites. Also, some of your example questions are not good stack exchange questions. Questions which solicit opinions are very poor questions for helping define a site, as they would be very poor questions on a site, the same with other questions which would be closed for any of the standard reasons. If you get frustrated by the speed at which Area 51 moves, feel free to suggest topics which you would like to be added to our scope here. We are always open to suggestions, and generally happy to include any topics which are tangentially related to Robotics, indeed Robotics and Automation are often considered to be synonymous with each other.